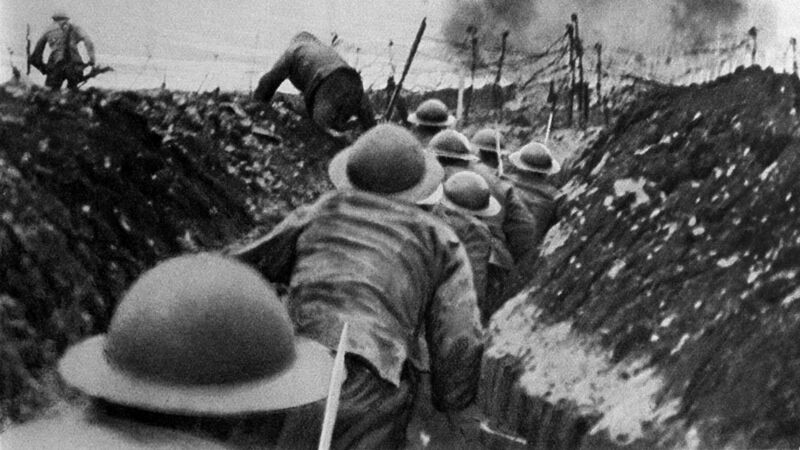 Soldiers of the English infantry in World War i run out of their trenches at the signal to assault in Somme, France, 1916. On Sunday, November 11, the world marked 100 years since one of the largest, deadliest, most shocking catastrophes in human history came to a merciful end. It has been just six years since the last surviving World War i veteran passed from the scene. Florence Green had joined the Woman’s Royal Air Force at age 17, two months before the war’s end: She died in 2012 two weeks shy of her 111th birthday. That is how recent this history is: It happened only a little more than one lifetime ago. A hundred years is a blip in time. Yet one great tragedy of this war is that its lessons have remained unlearned by the three or four generations of us who have been born since it ended. This has already had devastating consequences. Just 21 years after the war, unlearned lessons and unresolved conflict exploded into World War ii. That catastrophe mobilized even larger armies with even deadlier weapons over greater expanses for longer duration. It killed more than six times as many people. And now, nations are arming for a Third World War that will eclipse the Second more terribly than the Second did the First. World War i altered the world utterly and permanently. Advancements in the technology of war-making and slaughter made it a shocking nightmare. Just decades before, armies had fought with horses and bayonets; now they punished one another with machine guns, aircraft, U-boats, railway guns and mustard gas. They dug miles of trenches and draped them in barbed wire, creating a bog of death—a meat grinder into which they hurled millions of their young men. The armies on both sides were colossal. There was one soldier for every four inches of battlefront. Improvements in offensive weapons were countered by even greater improvements in defenses. The result was muddy, bloody deadlock. Advances were measured in yards, bought with tens of thousands of lives. On an average day on the Western front, 2,533 men were killed in action, 9,121 were wounded, and 1,164 went missing. The life expectancy for a machine-gunner in combat was about 30 minutes. Month after month passed, with neither side making significant gains, while battlefields soaked deeper and deeper with blood. He was right. In many ways, World War i was a defeat, not only for Germany and the other Central Powers but even for the nations that had subdued them—chief among them the force that had dominated the globe for over a century: the British Empire. World War I was a defeat, not only for Germany and the other Central Powers but even for the nations that had subdued them—chief among them the force that had dominated the globe for over a century: the British Empire. When the armistice was signed on Nov. 11, 1918, the world was a changed place. It is true that the British Empire emerged from Versailles with nearly a million square miles more territory, inhabited by some 13 million people. However, the empire would never recover from the wealth and manhood it expended, the prestige it sacrificed, the love and loyalty of its peoples that it lost. World War i dealt the era of British dominance and stability a fatal blow. Practically speaking, Britain could simply no longer afford to sustain its vast holdings. The maritime force by which Britannia had ruled the waves had been built on expenditures nearly double that which any other nation was allocating to its navy. After having spent £5 million per day during the war, the war chest was empty. But there was a more elemental crack opened up by the convulsions of the Great War. It seemed the world had passed from the age of heroes into a new age of disillusionment, intellectualism and cynicism. Certainly the sheen of the empire had been stained. A generation before, the British of the Victorian age sought to serve the world by spreading the advantages of civilization. These efforts were executed imperfectly, of course, but that the British Empire expanded education, improved public health, abolished slavery, expanded women’s rights, brought outcast peoples into public life, eradicated cruel pagan practices, created infrastructure, increased employment opportunities, increased prosperity, and brought many other benefits to peoples all over the Earth is irrefutable. Their cause was noble, they believed in it, and their beloved empire flourished. A German prisoner helps British wounded make their way to a dressing station near Bernafay Wood following fighting on Bazentin Ridge, on July 19, 1916, during the Battle of the Somme. After the war, this cause became a source of indifference. The war-weary public’s interest in England’s far-flung positions plunged. They redirected their interest toward personal security and comforts. Politicians, recognizing a popular shift away from conservatism toward more self-centered socialist political principles, diverted funds from defense to put toward welfare. At the same time, intellectuals began jeering the sacred virtues that had built the greatest and best empire in world history. An anti-imperial trend that had simmered on the margins of society years before overflowed into the mainstream. A spirit of condescension and derision was matched by growing fascination with triviality, immorality and ribaldry. This was an abhorrent reaction to the horrors of the Great War. It was a reflection of just how far Britain had fallen away from God. For in that war, the British had suffered a woeful curse. The military setbacks and their agonizing death tolls had dragged the British within arm’s reach of defeat. They had been spared, mercifully. But they had forgotten the truth of Psalm 33: “There is no king saved by the multitude of an host: a mighty man is not delivered by much strength. An horse is a vain thing for safety ….” It is God who determines the outcome of wars. God had given the British an empire. God had protected it from ruin. But an ungrateful generation gave Him no credit. And rather than turning toward Him, an unchastised generation turned further away. How did Britain go from its golden age—to this? 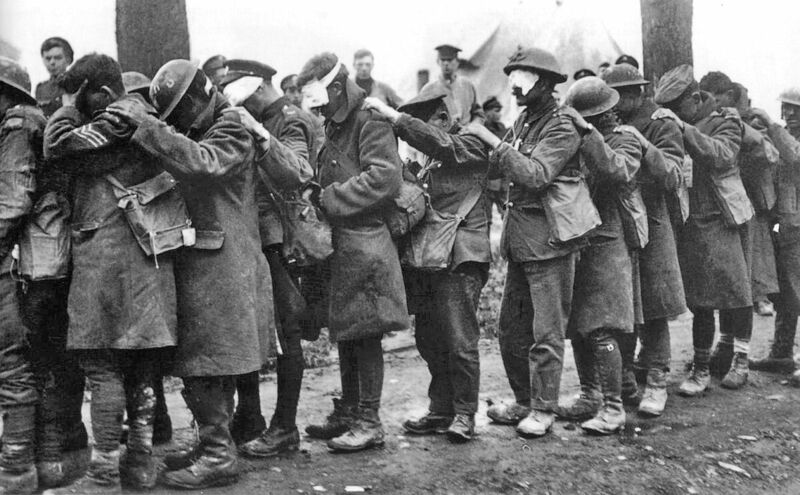 British 55th Division troops blinded by tear gas await treatment at an Advanced Dressing Station near Bethune during the Battle of Estaires. Dazzled by mammon, affluence, rationalism and the discoveries of modern science, the British found new gods to serve. Then the war came. And one of the things it exposed was that these material messiahs were false gods. God used that war to correct the British and the world—to show them that they were not invincible, that empire and even civilization itself are frighteningly fragile. He sought to awaken them from their spiritual stupor—to try to draw them back to Himself. Emerging from a war so terrible that it seemed to even degrade what it meant to be a human being, they chose to pursue their wayward path with greater abandon and to reject God more fully. More and more people turned toward rationalistic ideologies and materialism. The new generation of young men and young women worked, partied and played, smoking, drinking, driving motorcars and exulting in sensual and reckless behavior. This was the “Roaring Twenties,” an exacerbated and almost fatalistic continuation of its moral collapse. As the Prophet Isaiah said, “And in that day did the Lord God of hosts call to weeping, and to mourning, and to baldness, and to girding with sackcloth: And behold joy and gladness, slaying oxen, and killing sheep, eating flesh, and drinking wine: let us eat and drink; for to morrow we shall die” (Isaiah 22:12-13). A loving God could never allow such self-destructive behavior to go without trying to correct it. And within a single generation, the world plunged directly into the Second World War. Yet chastised by two world wars and a Depression in between, human beings found a way to again avoid repentance toward God. Virtues, morals and even family itself, which too few remembered to trace back to the Bible, devolved into “values” and “traditions” subject to intellectual inquiry and youthful rebellion. These virtues came under direct, deliberate attack by more and more ideologues, educators, commentators and entertainers. Where are we—Britain and America—on this scale today? Just over a lifetime on from World War i, where are we on this scale of morality? We are steeped in the very sins that so tempted Britain a century ago. The carnality, the materialism, the idolatry of science and psychology, the decadence, the corruption, the doubt, the faithlessness, the disillusionment, the cynicism, the disbelief in our cause and the loss of our heroes: These sins have grown so strong as to have not just torn down the old biblical code of conduct but to have formed themselves into an orthodoxy of their own. These are the sins that hollowed out the strength of the British Empire, that made it vulnerable to attack, that brought about the curses of a broken will and strength spent in vain. If we do not turn from those sins in repentance, then the punishment we suffer will be far more devastating. These sins have grown so strong as to have not just torn down the old biblical code of conduct but to have formed themselves into an orthodoxy of their own. Some may choose to believe that God is not aware of, does not care about, or is not involved in the affairs of the British, the Americans or any other peoples. They may believe there is no God at all. They may attribute the existence of the American superpower, the British Empire, biblical morals, family virtues, right and wrong, love, and even of truth itself to nothing more than the hallucinations of evolved ape-like creatures inhabiting the surface of a speck of dust. They may therefore indulge whatever pursuits or lusts they fancy in their amoral world. But for those who believe otherwise, we have Leviticus 26. Leviticus 26 is a chapter addressed to the ancient Israelites. Have you ever wondered why the British and the Americans and certain other peoples use the religious writings of the Israelites? Why the Israelites? Because we are Israelites. Britain and America are their modern-day descendants. And what did the Creator of the Israelites and of all human beings state in Leviticus 26? Curses for disobedience. Blessings for obedience. As much as we human beings want to find some way to wriggle out of that reality, that is the reality. Thinking back to the Great War and the inhuman suffering that so many humans endured—thinking of World War ii, which multiplied that suffering—and thinking ahead to World War iii, which will bring us face to face with extinction as a race—you can see just how persistently human beings choose disobedience and curses over obedience and blessings. Safety, strength, peace, wealth, family, meaning, purpose: These are the blessings God holds out to the nation that turns away from rebellion, vanity, human reasoning, materialism, sensual pleasure and sin. These are blessings the British and the Americans largely received in the past—and could have right now. These are the blessings God will grant to us and to all nations in the future. I sincerely wish that learning this lesson and receiving these blessings didn’t take another war.